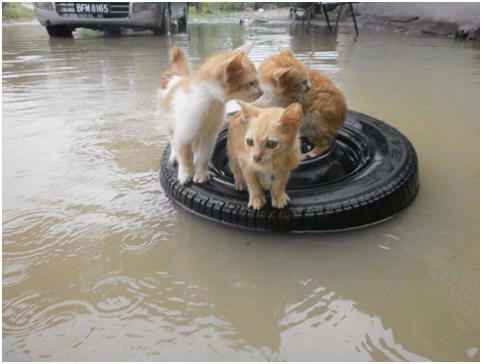 You may have a disaster evacuation plan but if you have pets or elderly family members, remember the 2019 floods and save this how-to-survive a disaster information. 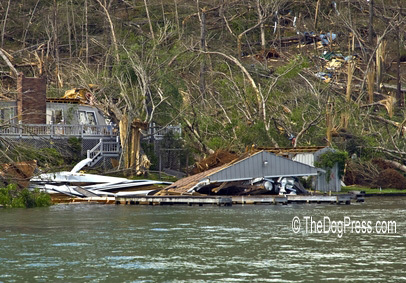 Everyone needs an emergency plan in the event of floods, fires, or other disasters. 9ou may already have a disaster survival plan but if you have pets or elderly family members, check it against this updated 2016 survival information. Hurricanes can wreak havoc but you have days to watch weather reports and prepare for possible evacuation. Other threats such as mob violence, chemical spill or gas leak, can swoop down in a matter of minutes. Something as ordinary as a power outage can mean big trouble unless you’re prepared to be without heat, food, or communication for days! Will the cat panic when loaded in the family car with your dog? You bet! Crates can be a virtual lifesaver - for the driver as well as the frightened animals. Purchase cloth-web leashes and martingale type collars for each animal. Animals will sense your distress and even a well trained dog may panic, twist back, and slip loose from an ordinary collar or literally choke in a choke collar. If your dog doesn’t usually wear a collar, purchase a buckle-on I.D. collar that can be permanently labeled with your name and phone number. Keep the I.D. collar with the crate or by the door so you can quickly slip it on your dog. Look for collars with waterproof pockets to hold pet prescriptions and if you have more than one pet, put duplicate medications in each dog's collar or tape them on in separately marked, tiny zip lock bags you can order on line or get at any pharmacy. Marked separately of course. Use electrical tape to also affix a minimum 48 hour supply of any medication to each animal’s crate. Attach an extra leash to the dog's pet carrier, which should be just big enough for him to turn around in so as to conserve space. If you have cats, birds, or other pets, be sure to prepare for safe transport. Have cage covers handy! Most hotels/motels will accept dogs and cats when they are in a pet carrier. Small Inns or Bed and Breakfast lodging might still have a vacancy may be more accepting of families with pets. If you are forced to take your pet to a shelter, a clearly labeled collar and pet carrier will insure they will take him and just as important, that you will get him back! 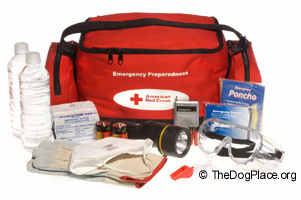 Make a list of disaster shelters and other accommodations that will accept pets. Do it today! Most emergency facilities won’t be thinking about scanning animals that are brought in without owners. However, if you should become separated and if the dog has managed to slip his collar, a thoughtful rescue, shelter, or vet tech might note that he is obviously not a “stray” and reach for the scanner. 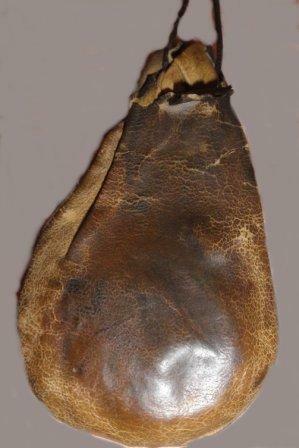 Native Americans carried the tanned-hide medicine bag containing their most important "good medicine" possessions on their person but you can settle for having your backup cash, credit cards, mementos and medications in a waterproof, lightweight satchel or sack. Separate medication for each person or pet into small ziplock plastic bags that can be purchased at the pharmacy or online. It would be wise to stash two weeks of medicine. Label each bag with waterproof indelible markers. Space and weight could be a problem so don’t worry about flea or heartworm preventatives. Just take medications. NOTE: Set a quarterly reminder to rotate the medicine in order to maintain freshness. You should have two bags, one for dry food and a lightweight “soft side” frozen food pack. People and pet food “survival packs” go together in the dry food pack. Any refrigerated medicines and other perishables go in the cold pack. Your pet may be accustomed to raw meat or canned food but one spoils and the other is heavy if you are forced to hike it. Dry food is survival, for you and your pets. If you have a medium or large size breed, accustom the dog to a pack harness now. He’s doing to require more food and water than a cat or toy breed but fortunately, with just a little foresight, he can carry his own and then some! Water packs are obviously essential but they are heavy. It might be wise to include small packets that sterilize unsafe water. Take nothing for granted. Your emergency evacuation plan should include the unthinkable, just in case. You probably have photos of your children, elderly family members, and pets. Put them in the waterproof survival pack. Photos are of critical I.D. value if you become separated. Photos can make rescue and recovery possible because people can be injured or become disoriented in an emergency situation - just like your pets! Self defense could become necessary no matter what kind of emergency forces you from the safety of your home. If you are against firearms, at the very least, have a stun gun and a good supply of pepper spray. If a disaster lasts more than a few days, predators will be on the prowl and most of them will be human. Each family member should carry some form of personal protection. Good people do bad things and in extreme situations, even a Five-Star hotel may not be able to provide adequate safety for you and your family. 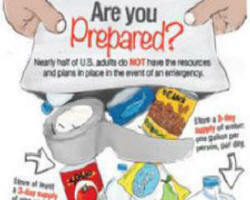 We hope this evacuation information will never be needed but we should all be prepared before disaster strikes. 2015 and 2016 saw unprecedented railway disasters and mob violence in major cities. 2017 started with record weather disasters and 2019 is already record-setting floods so don't leave your computer without making a disaster plan checklist! Will your local shelter allow you to take your animals?